Foldaway beds are a great option for a small bedroom. 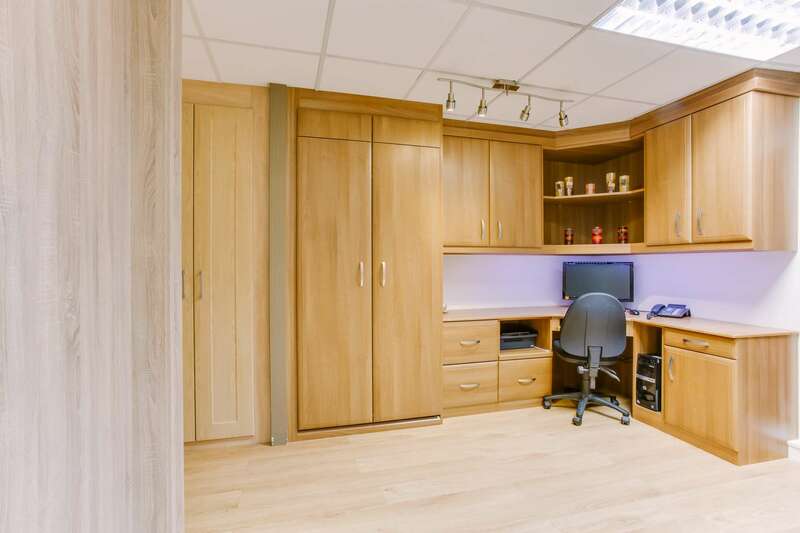 Most of all, when combined with a fitted home office you can make the best use of the space you have. When the foldaway bed is closed-away it looks like a normal wardrobe or cupboard, but when it’s folded down the single or a double bed is revealed. 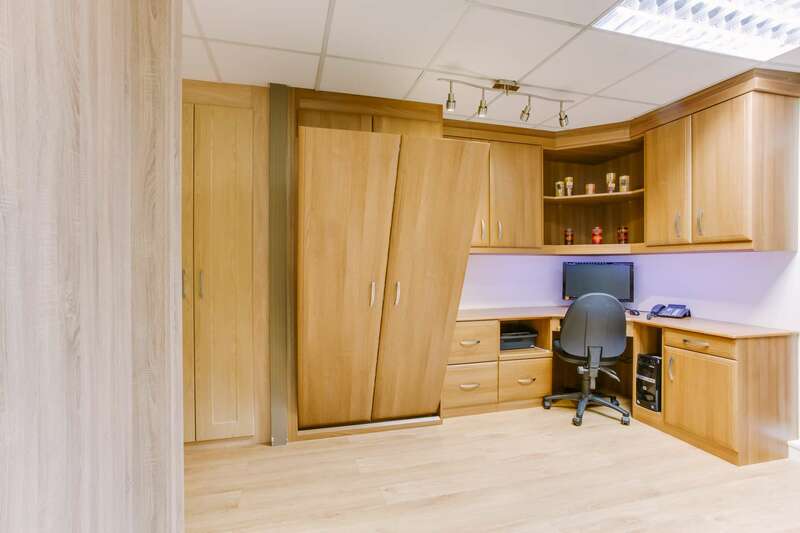 The one in our Ferndown showroom is a part of an office setup, as per the pictures below. Furthermore, the beds we use come from Hideaway and are integral to the fitted furniture design. As part of your fitted furniture you can buy a hideaway bed which is disguised as a wardrobe until you need to open it as a pull down bed. These space saving wall beds are easy to use and make excellent use of a small space. In our Dorset showroom we have an office layout with a folding bed built-in. The bed is a single option and once folded away looks like a everyday wardrobe. 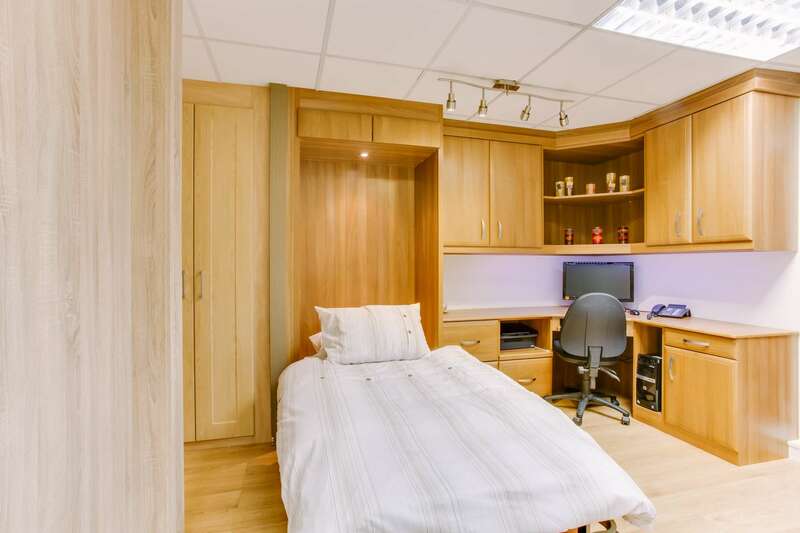 This is ideal for space saving and making the most of a space room or study. By far the best use of a foldaway bed is to save space. 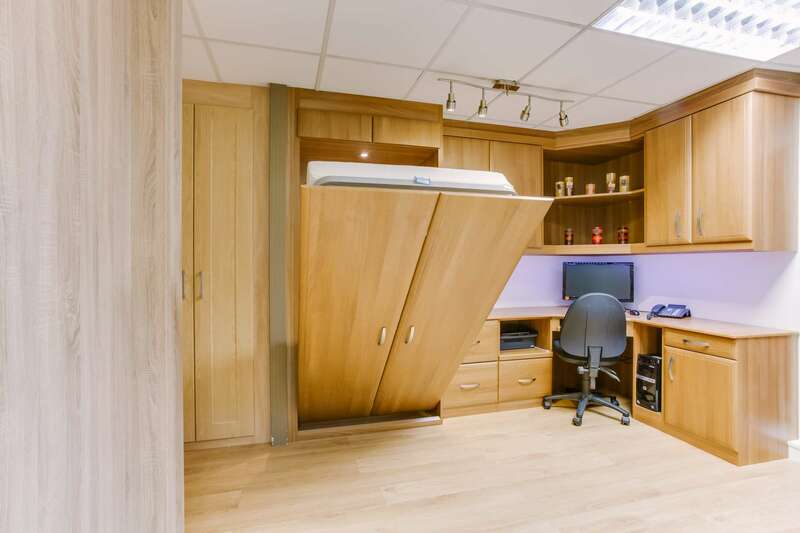 Combined it with other fitted furniture to make the best use of space. Do you have a small box room? If you do you could have it converted to a multi-purpose room. Use foldaway beds in cupboards/wardrobes are the perfect solution. The bed is disguised as a cupboard/wardrobe and will match the rest of the bedroom furniture. Since the above foldaway bed is fitted in our showroom, you can see it in action. In addition, customers are invited to try-out the mattress. The mattress for a foldaway bed needs to be of a certain type. First of all, the thickness must be around 165-170mm deep for the bed to fold away without obstruction. Secondly, the weight of the mattress is especially relevant to work with the sprung counter-balance mechanism. We have both the single and double options for a fold away type bed and you can have this either a vertical SwingAway bed system or the SwingAway Horizontal system. The SwingAway bed is the most popular and cost effective wall bed system and once the bed has been installed, it can be used immediately. The SwingAway system has a counterbalanced sprung mechanism so working with the weight of the mattress it has a safe, light and easy finger touch action when lifting up and down. Wall Bed mechanism (including bed frame / lying surface) which we build in to a wardrobe or cabinet. Can be used with most mattress types – please call for more information on this. The foldaway bed in our showroom has a foam style mattress for customers to try-out. Counter-balanced spring mechanism allows weightless lifting action. 5 year warranty on the spring mechanism. Professionally fitted in your home by our expert fitters. The SwingAway bed can be hidden away behind a cabinet with bi-folding/sliding doors for optimum effect and will be built-in to whatever suits the room from elegant furniture to a fun kids bedroom. So why not pop-by our showroom and try it out and then book a free design appointment with one of our professional bedroom and office designers. The mattress for the pull down bed must be of a certain size and weight. This is so that it can be accommodated within the bed housing. The maximum depth of the mattress must be no more than 180mm. The following mattresses are ideal for our pull down beds: Orthosoft Mattress – The Orthosoft range features a softer core for enhanced comfort, low allergy properties, dust mite resistant and highly recommended for a healthy nights sleep. Click her for more details. Duet 500 Mattress – The Duet 500 is a luxurious memory foam mattress. Two separate layers of pressure-responsive ‘space age’ memory foam act together to provide the ultimate in sleeping comfort. The thin top layer gives a luxurious, soft surface on top of the main responsive layer which adjusts to your profile. Click her for more details. Waterlattex Mattress – Waterlattex is the luxurious comfort solution mattress. Click her for more details. The mattress we sell is the ValuePac Visco Roll Up Mattress. If you would like to see what this mattress is like and to see a pull down bed in action, please visit our showroom.